They begin arriving early, nearly an hour before the event is scheduled to start, on what turns out to be the first crisp day of October. Reporters with notebooks in hand grab seats in the large, fluorescent-lit press pressroom on the third floor of Toyota Center. More than a dozen camera people jockey for position on risers and test their mics. This is the Houston sports story of the season and every industry journalist wants a piece. There are invited guests too—astronaut Scott Kelly, local news legend Dave Ward—senior officials with the Houston Rockets organization and Landry’s Inc. They mingle and glad-hand in what soon becomes a standing room-only space. As the appointed time for the press conference nears, the crowd quiets and an anxious energy replaces the chatter. Cameras and iPhones are trained on the doorway, eager to capture the first image of a man in triumph. Tilman Fertitta, dressed in a sharp dark suit and red tie, enters with a beaming smile to rousing applause. He and Rockets CEO Tad Brown take seats in front of a backdrop dotted with the logos of the Rockets, Toyota Center and Landry’s as the cheers continue. The deal is done. The NBA has approved the business mogul’s purchase of the Rockets. He has won a prize he had coveted since adolescence, one he refused to let slip through his fingers a second time. Fertitta got his way eventually. He nearly always does. Over the last four decades the 60-year-old entertainment and hospitality magnate has led a Houston-based company that’s helped shape those industries not only here but across the country—from casinos and hotels to restaurants and attractions. His popularity and recognition have soared in recent years thanks to his CNBC reality show Billion Dollar Buyer. With his affable Texas accent and natural ability to engage on and off camera, Fertitta is arguably one of the greatest showmen of his generation. And he’s nowhere near done. 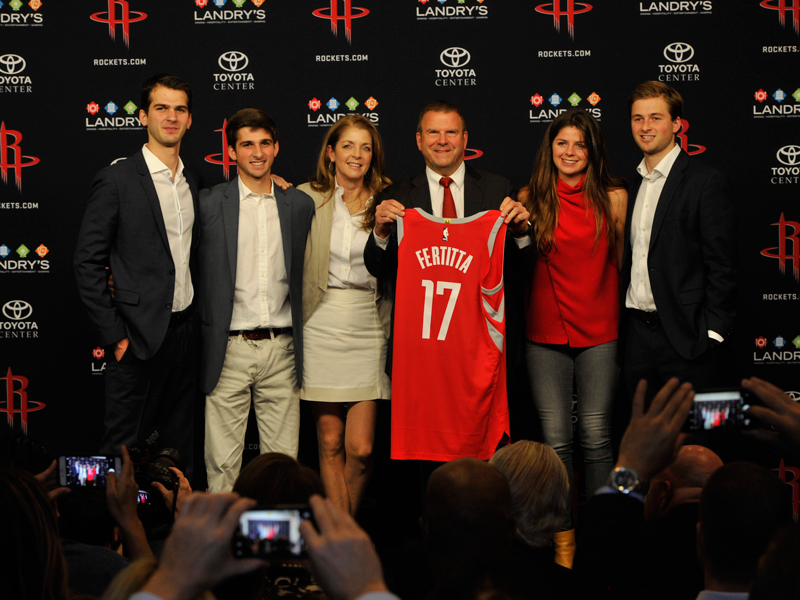 By all accounts, Fertitta’s purchase of the Houston Rockets is historic. The $2.2 billion price tag represents the most anyone has ever paid for a North American professional sports franchise. For a shrewd, often cutthroat businessman used to getting the best price for the assets he acquires, the Rockets deal was viewed by some observers as atypical. Fertitta had made a play for the Rockets before. In 1993 he bid $81 million for the team and lost out to Les Alexander. When Alexander announced this past July he was interested in selling the team after 24 years, it didn’t take long for Fertitta to make his interest plain. Looking at each deal in terms of the bottom line and an eagerness to play hardball has propelled Fertitta and his company to new heights through the years. He’s adept at identifying floundering businesses, often in the restaurant arena, buying them cheap and turning them into cash machines using the Landry’s method. Today, Fertitta Entertainment Inc., which operates Landry’s Inc. and the Golden Nugget Casinos, is a $3.4 billion enterprise with restaurant, hospitality, gaming and entertainment operations across 34 states. A number of entities expressed interest in the Rockets after Alexander’s surprise announcement. But, according to Tad Brown, the former owner wanted someone who would keep the team in Houston, shared his own pride in the local community and would be a good steward of the franchise. Brown says Alexander saw all those things in Fertitta. “It was the Friday [before Hurricane] Harvey was hitting, we were closing the offices and Leslie told me to engage in closing discussions with Tilman," Brown says. Via FaceTime, Brown conveyed the news to Fertitta who was on his boat in Marina del Ray shooting Million Dollar Buyer. The typically stoic Fertitta put his head down and began to cry. “And you could see, immediately, that it was the right call,” Brown says. As part of the deal, the company also acquired the Toyota Center where the Rockets play. That means Fertitta controls one of the largest venues in the city, which beyond basketball plays host to dozens of concerts and other special events throughout the year. That’s music to the ears of a guy who owns several restaurant concepts that can be adapted to a concession format. Asked if such additions were in the works, Fertitta answers with an unequivocal “yes,” later joking that it was unlikely he would be allowed to add one of his casinos to the building. Tilman Fertitta grew up on Galveston Island and was working in the family restaurant and trying to run things by age 12. He developed an early affinity for business and launched his first company, a woman’s clothing store, on a $6,000 line of credit in 1979. A few years and deals later he was an investor in a small restaurant company called Landry’s Seafood when he reached an agreement to buy out his partners in 1986. 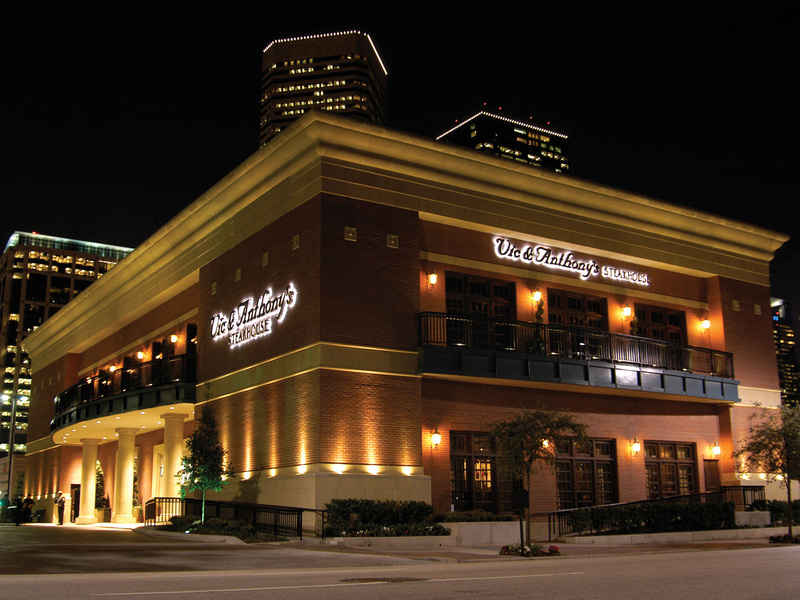 In the ensuing years he built a number of Landry’s across Texas and Louisiana and took the company public in 1993. Overnight, Fertitta was worth $100 million. He was just 36. In a 2016 interview with the magazine Iris Covet Book, Fertitta extolled the virtues of risk taking. In business, “you cannot be scared. If you want to be an entrepreneur and make big money you cannot be scared.” While tech and other industries have helped some individuals strike it rich by being at the right place at the right time, to do it like him, “by bricks and sticks … you can’t have any fear.” Landry’s grew dramatically as a public company, from nine restaurants to 200 in 17 years. In 2010, after several unsuccessful attempts, Fertitta was finally able to take Landry’s private again in a deal valued at $1.4 billion. The man with a very particular management style was once again in complete control of his company, no longer beholden to Wall Street and investors. He’d gotten what he needed out of trading publicly, now it was time to take more risks. In the years that followed, Landry’s would add a series of new brands to the portfolio, from family-friendly concepts like Bubba Gump Shrimp Co. to high-end boutique chains like Morton’s The Steakhouse. With each acquisition, the company grew and the asset’s performance improved. Few could argue Fertitta had the hospitality industry’s golden touch. Fertitta “looks for the diamond in the rough,” says Professor John Bowen of the University of Houston’s Conrad N. Hilton College of Hotel & Restaurant Management. “He sees opportunities in iconic brands that have slowed down a bit but have a good name, and he’s able to turn them around.” The hospitality mogul has also proven adept at amassing businesses that create synergy and feed off one another, Bowen says. Take for instance his 2005 purchase of the original Golden Nugget Casino in Las Vegas. 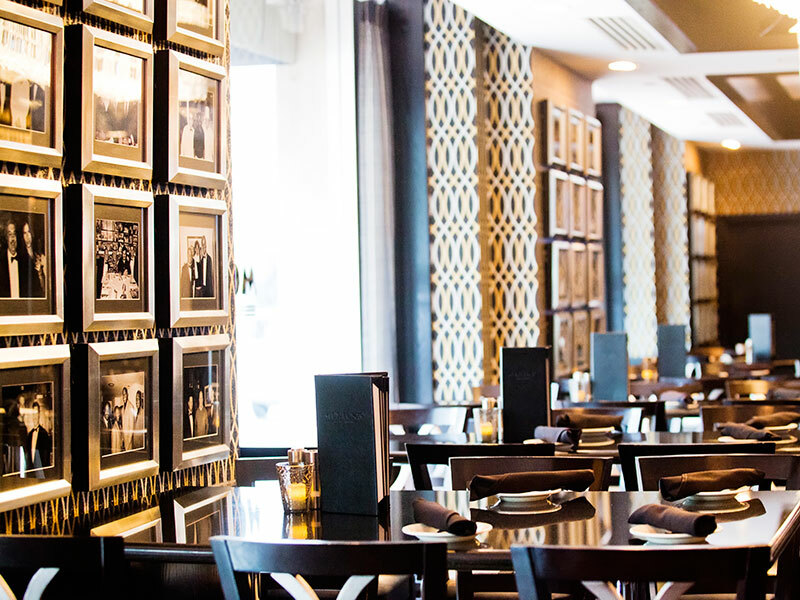 Not only did the once-floundering Golden Nugget reverse course under Fertitta following a multi-year, $200 million+ renovation and expansion, it now hosts a series of Landry’s restaurant concepts. Since then, Fertitta has built a new Golden Nugget in Lake Charles and transformed existing properties in Biloxi and New Jersey into Golden Nugget casinos, all with his signature restaurant brands. Perhaps no other individual has as much invested in Downtown Houston today as Fertitta. His company owns a slew of restaurants in the district—from premium steakhouse Vic & Anthony’s to the new Grotto that opened earlier this year at the George R. Brown Convention Center along with —the Westin Hotel, the Downtown Aquarium complex and now the Toyota Center as well as its marquee inhabitant. To be sure, Fertitta saw opportunity in Downtown long before most. In 2000, he won the right to redevelop a former firehouse and water works building near City Hall into what he promised would be a top-tier attraction. At the time, Downtown was far from being a leisure destination in the city – ts concentration of skyscrapers hosting a workforce that fled after 5 p.m. on weekdays. But Fertitta believed such an attraction could serve as a catalyst. In 2003, Landry’s opened the six-acre Downtown Aquarium complex that included an aquarium, restaurant, banquet facility and amusement rides. 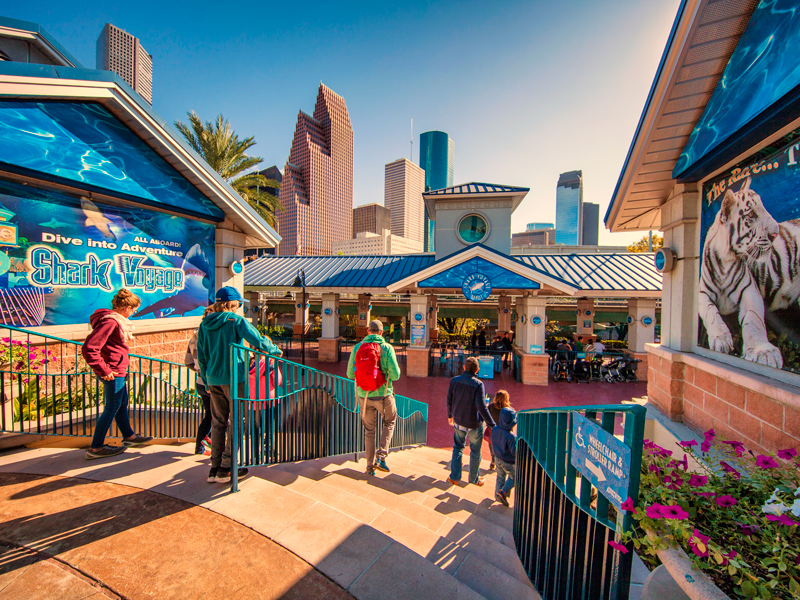 When the national CityPASS tourism ticketing program launched in Houston in 2008, the Downtown Aquarium was selected as one of the seven featured attractions and remains so today, cementing its place as one of the city’s top “things to do.” The attraction’s success would prompt future similar developments in Denver, Nashville and Landry’s own Kemah Boardwalk south of Houston. Fertitta is likely referring to a proposal first announced in late 2015 to expand the Aquarium outside of its current boundaries. The company has been working with the Association of Aquariums and Zoos on a plan to develop a multimillion-dollar outdoor habitat for its white tigers complete with a waterfall, pool and rock features. With AZA approval now in hand, Landry’s general counsel Steven Scheinthal says construction on the project can proceed and should be completed next year. Scheinthal says the new habitat will provide an “enriching environment” for the endangered cats and an immersive and interactive experience for guests. The habitat expansion follows years of battles and lawsuits between Landry’s and animal rights groups over the current indoor habitat for the white tigers—an issue the company surely hopes to put to rest while also giving customers a new reason to visit the attraction. The Fertitta touch certainly doesn’t end at the edge of Downtown. The Landry’s owner has helped transform the entire region as a tourist draw, Bowen says. Fertitta turned the once sleepy fishing village of Kemah into a destination with amusement rides and other attractions. And, adds Bowen, he helped bring tourism back to Galveston after Hurricane Ike with the opening of the Pleasure Pier. Fertitta could not be more bullish on Houston’s rise as a leisure destination. One need only look to his latest development project as evidence. Rising above Uptown is the 38-story tower dubbed The Post Oak. Slated for completion early next year, the 10-acre, mixed-use property will feature a 250-room luxury hotel, 20 residential units, two large restaurants, five retail stores, a two-story Rolls-Royce showroom and more luxury amenities. That project is certain to be the newest crown jewel in Landry’s luxury holdings. Back Downtown, Fertitta points to the addition of the Marriott Marquis as a second convention center hotel and other developments on the east end around the George R. Brown Convention Center as examples of a district that’s a growing leisure draw. “The city and Downtown have come a long way for sure and I think we’ve got a lot more ahead of us,” he says. But of all that Fertitta has built and acquired, for him nothing compares to his latest deal. "I don't want to take away anything from the great things that I've been able to build for the Houston area … but this is the ultimate. You're in a club of 30,” he says, referring to the fraternity of NBA owners he now joins. “Anybody can go build a boardwalk, anybody can go build an aquarium, anybody can build tall buildings, but not everybody gets to own an NBA franchise." It’s an incredulous notion, the idea that “anyone” could do the projects Fertitta has thus far. And yet it crystallizes the entrepreneur’s perspective that his accomplishments are the result of hard work and business savvy, nothing more. Fertitta describes a rather surreal scene when he sat down with his wife Paige and their four kids before inking the Rockets deal. But while Fertitta is willing to let Rockets management take the lead, he’s quick to point out he’s ready to make tough decisions when necessary. He didn’t get this far ducking the hard ones. “The name of the game is to get to the playoffs,” he says. “We’re going to do whatever it takes to win. I promise you that.” Because at the end of the day, it’s all about entertaining the masses and making them want to come back. “I’m in the hospitality business,” he offers as a reminder. “There’s a saying I preach every day: there are no spare customers.” And Fertitta sees us all as just that: customers and guests. Whether we’re dining at his restaurants, gambling at his casinos or enjoying the hard-court action with the Rockets.